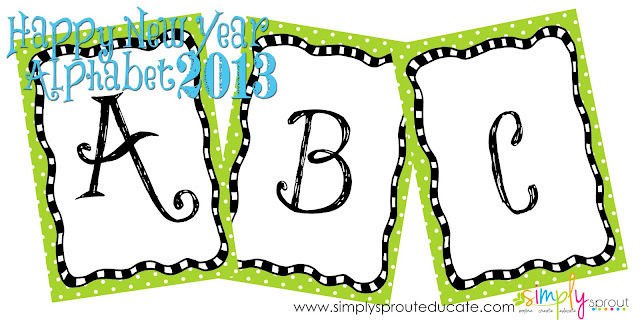 Many of you head back to the classroom tomorrow and welcome in a New Year with your class. This was always my favorite time of the year in the First Grade classroom because you could see so much growth in your students. They would come back in sporting more missing teeth, showing off their reading skills and acting a little more like Second Graders than Kindergarteners. I always loved making goals for the new year with my students. Having them focus on what they would like to learn or change in the new year. I hope you enjoy this freebie in your own classroom, it would make a great classroom bulletin board display or be great in a book for your reading corner. Start the New Year off with this colorful display. Create your own banner using the alphabet provided in this kit. To make a banner with the letters, hole punch the top corners of each letter and then tie together using colorful ribbon, tuelle or ric rac. For some more creative and colorful ideas be sure to stop by and check out what's new on our Pinterest board!